Viewed by most of mankind as a depraved, despotic dictator, Saddam Hussein, a master manipulator, manages to confound the twelve American soldiers sent in secrecy to guard him during his captivity and his final days on earth. Will Bardenwerper tackles the difficult topic of a terror-inducing Hussein in The Prisoner in His Palace, a narrative likely to wreak havoc on your senses by questioning the man himself, the myth and his eventual demise. An incredibly intense read, I was horrified to find myself in tears over Hussein’s last moments with his Super Twelve, something I would never have expected for this monster. In the tradition of In Cold Blood and The Executioner’s Song, this haunting, insightful, and surprisingly intimate portrait of Saddam Hussein provides “a brief, but powerful, meditation on the meaning of evil and power” (USA TODAY). The “captivating” (Military Times) The Prisoner in His Palace invites us to take a journey with twelve young American soldiers in the summer of 2006. Shortly after being deployed to Iraq, they learn their assignment: guarding Saddam Hussein in the months before his execution. Living alongside, and caring for, their “high value detainee and regularly transporting him to his raucous trial, many of the men begin questioning some of their most basic assumptions—about the judicial process, Saddam’s character, and the morality of modern war. Although the young soldiers’ increasingly intimate conversations with the once-feared dictator never lead them to doubt his responsibility for unspeakable crimes, the men do discover surprising new layers to his psyche that run counter to the media’s portrayal of him. Woven from firsthand accounts provided by many of the American guards, government officials, interrogators, scholars, spies, lawyers, family members, and victims, The Prisoner in His Palace shows two Saddams coexisting in one person: the defiant tyrant who uses torture and murder as tools, and a shrewd but contemplative prisoner who exhibits surprising affection, dignity, and courage in the face of looming death. In this thought-provoking narrative, Saddam, known as the “man without a conscience,” gets many of those around him to examine theirs. 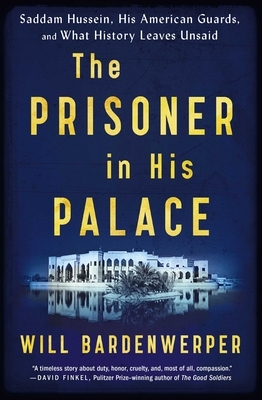 “A singular study exhibiting both military duty and human compassion” (Kirkus Reviews), The Prisoner in His Palace grants us “a behind-the-scenes look at history that’s nearly impossible to put down…a mesmerizing glimpse into the final moments of a brutal tyrant’s life” (BookPage). "Bardenwerper deftly toggles from a nonstop supply of terror to occasional scenes of normal life throughout The Prisoner in His Palace . . . a brief, but powerful, meditation on the meaning of evil and power." "What ultimately emerges is how to comport oneself in the world . . . [Saddam] was condemned to hang, a grave and deserved insult in Iraqi eyes. But 'the ugliness of the old man's death'—defiled in his winding sheet, kicked and stabbed after being strangled (the drop was bungled goes the story)—disgusted The Twelve . . . This is no reverse Stockholm syndrome at play, Bardenwerper convincingly suggests, but a bracing affirmation—a great Whitmanesque hug—of human dignity in the face of all that is harrowingly wrong." "Takes you inside the minds of the prisoner and his protectors, whose sole task it to guard the 'Vic,' or Very Important Criminal . . . The book is captivating . . . a study of how proximity has a propensity to be persuasive, even when the common area is a cell in the basement of a courthouse." "A behind-the-scenes look at history that's nearly impossible to put down . . . [Intersperses] tales from Saddam's past with scenes of his final days . . . As he was being led away to his execution, Hussein thanked the twelve Americans guarding him, adding that 'they'd become "more like family to him" than any Iraqis had been.' The Prisoner in His Palace offers a mesmerizing glimpse into the final moments of a brutal tyrant's life." "In skin-crawling detail, Will Bardenwerper effectively captures a unique time and place in an engrossing history. A singular study exhibiting both military duty and human compassion." “In the American imagination, Saddam Hussein functions as nothing more than a two-dimensional despot, a monster who terrorized and gassed and desecrated his own people. He was. He did. Will Bardenwerper's The Prisoner in his Palace reveals something else about Saddam, though, something less simple than that known caricature and certainly more troubling: he was a human being, a human like all of us, a human being with hopes and dreams and regrets that woke him in the dead of night. Saddam wrote poetry and longed for his family and treated the American soldiers tasked with guarding him during his trial with kindness and generosity of spirit. This is a brave and piercing book." "The Prisoner in His Palace finds humanity in a singularly inhuman figure, Saddam Hussein. Through meticulous reporting and beautiful storytelling, Will Bardenwerper has crafted a portrait that is both deeply moving and deeply disturbing. This book challenges the tired constructs of ‘good versus evil’ that have led us into so many ill-conceived wars." "What an astonishing story. Through meticulous research and a keen eye for detail, Bardenwerper does the near impossible: convinces the reader to empathize with Saddam Hussein during his sad final days. The Prisoner in His Palace is a deeply human book, and though we all know the ending, I couldn't put it down." "Bardenwerper’s examination of how soldiers, trained to focus on the inhumanity of the enemy, struggle to frame and reframe that inhumanity, is the focus of The Prisoner in His Palace. The book’s action will pull you along like any great military adventure, but bubbling underneath is an absorbing and sometimes heartbreak­ing survey of young men grappling with a moral certitude that begins to shift below the desert sands they’re standing on."